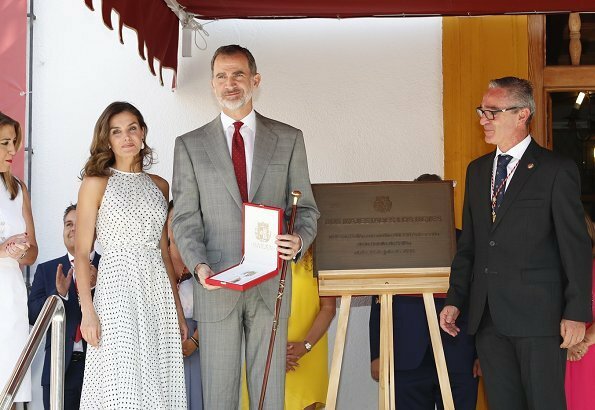 On July 19, 2018, King Felipe VI of Spain and Queen Letizia of Spain visited the city of Bailen in occasion of the 210th anniversary of the Bailen Battle in Bailen, Spain. (The Battle of Bailén took place from 16 to 19 July 1808 between the Spanish Army of Andalusia and the 2nd Corps of the French army and resulted in the first ever open field defeat of the Napoleonic army). Love the whole look. Her make up is always perfect. At today's event , their Majesties were total perfection. Letizia a little sun kissed and a beautiful dress and jewelry and the smile to go with it,very very nice. Just perfect - from head to toe. She has been wearing a lot of Carolina Herrera lately. I do like this dress. 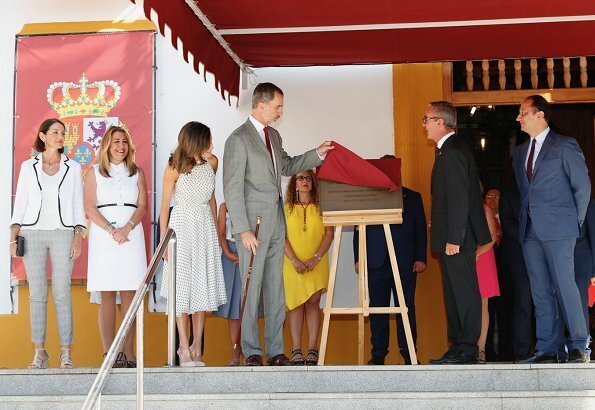 Didn't Letizia wear another dotted dress not long ago. I don't think it was this one, but maybe it was. Anyway, this dress looks nice on her, very summery! Este vestido es CH y lo estrenó en su viaje de Cooperación a Rep. Dominicana. El otro de lunares más grandes lo llevó en Texas y es de la española Matilde Cano. Me gustan más los zapatos de hoy que los Prada negros del estreno. 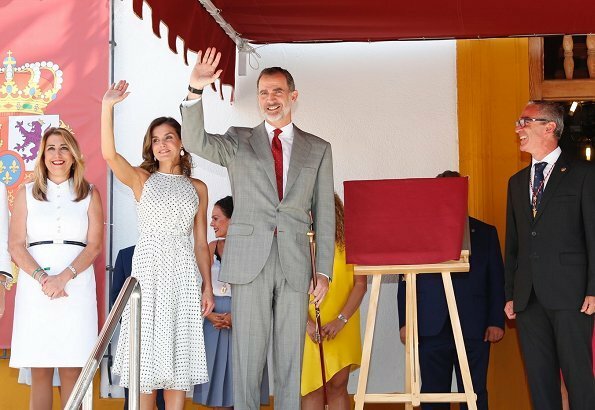 Letizia se ve encantadora, con el pelo ondulado y maquillaje suave. Absolutely stunning - she looks wonderful! I so admire whatever weight lifting (or other exercise) she is doing to look so strong and keep her arms so toned. At my age, don't think mine will ever look anywhere near that good (ha!) but she inspires me to try :). She just knocks it out of the park!!! Oh Letizia, when is it not all about you. The style of this dress will always be current, and it can be repeated many times. It is very flattering, and hugs or skims away from the body in all the right places. ...It does not take much effort to disparage, but to make an actual fashion savvy comment must be very taxing to the cerebrum. Yep! That happens when you are the queen, specially when you look drop-dead gorgeous. Maybe you should send a letter to the palace and suggest that she stays in the corner, and dresses like my granny. Letizia looks wonderful. Liked this dress the first time I saw it and today too! Also like the shoes in black and now cream/white today. In these pics and others I have seen, Letizia is walking, waving, standing by her husband, and greeting crowds. Catherine, Meghan, Maxima, Victoria, and others do these same things at engagements, so not sure why the previous comment about it "all about her". Some have criticized Meghan for the same thing, when other royals act the same way. Comments should be nice and not so judgmental regarding someone's personality. Letizia looks amazing--everything about this look. Like the previous comment, I cannot see what caused the "all bout her" comment. She looks like she was doing her job as professionally as she always does. Dare one suggest that Meghan could look to Letizia for fashionable but classy summer dressing? -- think there's only 4 or 5 years age difference and their body shape/height is not dissimilar. The queen has started off the summer at the top of her game. All of her outfits have been beautifully fitted or elegant and flowing. What is interesting is that she is clearly a fashion icon for some of officials who accompany her. Yesterday the minister wore a red suit with the openings on the sides of the pants and the detail on the pockets that we have seen on the queen's red pantsuit. Today, the Andalusian lady's dress is quite similar to the Varela worn in New Orleans. This lady in particular has several pieces that are quite similar to the queen's outfits and even owns one of the same CH dresses. It seems the bloggers are not the only ones who follow Letizia fashion. Sorry, but it's not the same lady, yesterday it was the Minister of Defence and today's the President of the Andalucía. That is what Anonymous at 3:44 PM says: yesterday the minister Margarita Roles and today the Andalusian lady, that is, the president of the Comnidad Autónoma de Andalucía, Susana Díaz. Interesting fashion note. Today, Susana Diaz (Andalusia) visited P. Sanchez. She wore a white outfit, but what is interesting is that the belt had the same large rivets that we saw on the white dress worn by RL when she was visited by Infanta Pilar. Perhaps the belt was adjusted for a perfect fit by RL. Getty images. Although she would like the focus to be more on her work, others are paying attention to the whole package she presents.